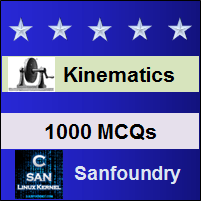 This set of Machine Kinematics Multiple Choice Questions & Answers (MCQs) focuses on “Linear Velocity – 1”. Explanation: The relative velocity of any two points on a rigid link is always normal to the line joining the two points. Let ω1 = Angular velocity of the link OA or the angular velocity of the point A with respect to O.
r = Radius of the pin. 7. A thin circular disc is rolling with a uniform linear speed, along a straight path on a plane surface. Which of the following statement is correct in this regard? a) All points of the disc have the same velocity. b) The centre of the disc has zero acceleration. c) The centre of the disc has centrifugal acceleration. d) The point on the disc making contact with the plane surface has zero acceleration. Explanation: The centripetal or radial component, is perpendicular to the velocity of the particle at the given instant. The tangential component, is parallel to the velocity of the particle at the given instant.